Great SUP core fitness, great SUP core training—and great fun! 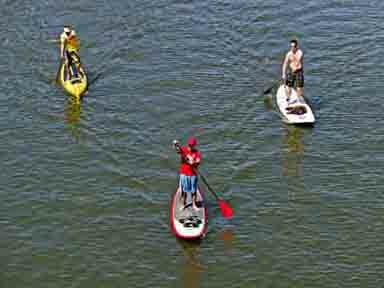 SUP core fitness, training and fun: proof positive that good things come in threes. We know about the fun part, but let’s get straight on what the "core" is and why paddle boarding is ideal for this type of fitness and training. Basically, the core includes your middle area called the torso. Specifically, the muscles that run from waist to sternum, the low back, the middle sides of the back also called lats, the gluts, and the obliques running from the upper hips to the ribs as well as the upper thighs are all part of the core. The upper thighs are included because some of the upper core muscles extend down into this area and go down as far as the calves. The way your body—especially your core—engages when stand up paddle boarding is what makes this sport unique when it comes to core training and fitness. What makes paddle boarding different when it comes to SUP core fitness? Resistance activities and sports work specific muscle groups at separate times. What makes paddle boarding different is that all the core muscles and a multitude of other major muscles are engaged at the same time: the neck the upper back, shoulders, arms, wrist, fingers and the lower body right to the ankle and toes. It takes a wide range of muscles to balance, move forward while paddling, watch where you're going, and grip the board with your feet, toes and legs at the same time. That’s full body engagement! Balance relies on our core muscles—and balance is key to paddle boarding. 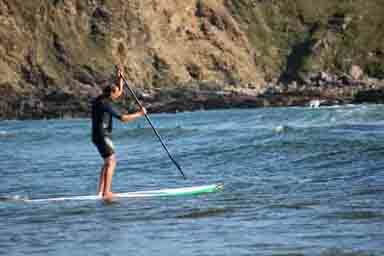 The core training we get while balancing on the board is affected by various conditions: flat water, swells, waves (taken head on or sideways), and wind. Add the paddle, and even more muscles are engaged. It’s a guaranteed formula to provide a unique core fitness and training. One of the most common questions answered: can I get a good workout? Paddle boarding is infectious: if your son catches the bug it won’t be long before he’s persuading you to buy a board, collect a friend, and take walk on the water too. Don't be surprised to find your daughter paddling with her grandmother. Take along a passenger—your toddler or your terrier—for added fun, challenge, and that core fitness fix. Want to know more about SUP core fitness and training? Check out the links below. Cardio warm-up for paddle boarding. By StandUpPaddlingTV. SUP core workout 1 and 2. By StandUpPaddlingTV. Balance boards for pre training to get ready for several sports including paddle boarding. 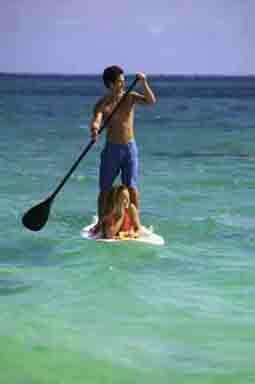 Even a casual SUP cruise will burn significant calories (see chart). Balance relies on our core muscles—balance is key to paddle boarding. Senior enthusiast out for a full body work out river cruise.